Read the Key Verse with your class. Ask your students if they have ever learned anything (i.e. : how to ride a bike (drive), how to read, etc.). Did it take time? Were you very patient? Did the knowledge of what you would be able to do once you learned encourage you? Knowing how to live a Christian life, pleasing God, takes time and patience. But we are comforted (encouraged), knowing it is an important thing to do, and with the hope (confidence) we will spend eternity in heaven with Jesus. That is why the Bible was written. So we could learn these things. Summary: Today we continue with the second of the Personal books, Psalms. Remember that the Psalms is broken up into 5 books. We will look at book four of the Psalms (chapters 90-106) today, comparing them to the book of Numbers. If you remember, the main theme of Numbers was wandering in the wilderness when they were disciplined for disobeying God. They learned to completely rely upon God – for food, water and protection. During the book of Numbers, we saw God guiding, providing for, and protecting His people until they reached the Promised Land. As we compare Numbers to the 4th book of the Psalms, see how God has always been there for His people, providing and protecting. He wants to be the ruler (king) of their lives. Man will not live forever. For those who choose to put their trust in God, He becomes a personal God. A relationship is established. He becomes their refuge – just as God was for the Israelites in the wilderness. Emphasis: Once we have placed our trust in God (Jesus), we must dwell in Him (live a life pleasing to Him). One idea for today’s lesson: (See picture below). For today’s lesson I had a small shield craft with a small clothespin that glued to the back. We glued a magnet to the back of the clothespin so it could hang on a metal surface (like a refrigerator). 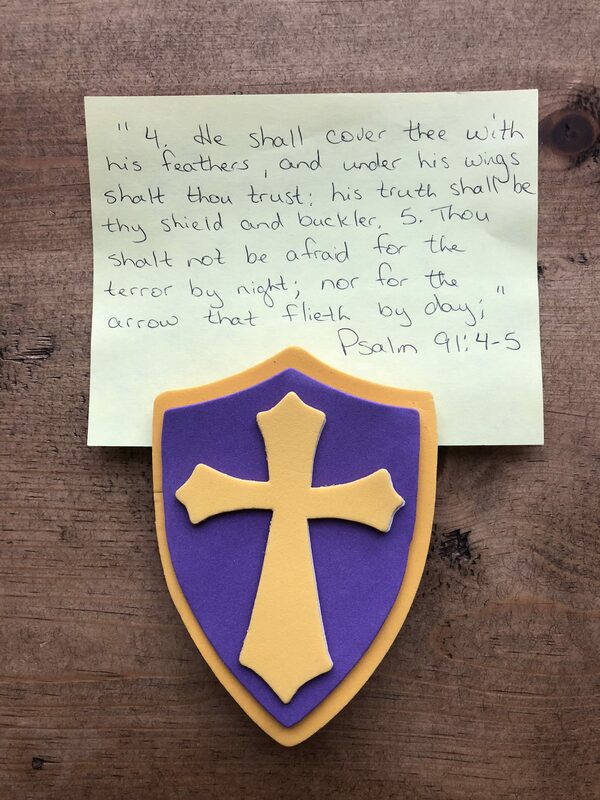 We then took a small piece of paper and wrote the verse Psalm 91:4-5. After they wrote the verse, we clipped it into the clothespin. This is a good verse to remember that God will take care of those that belong to Him.